Unfortunately, there’s no such thing as an easy button. What we DO have though is something better, and that’s called a plan. If you want to gain followers, spike your traffic, and even build an audience that is dying to buy your latest course or product, then you definitely need to start by increasing your blog’s reach. 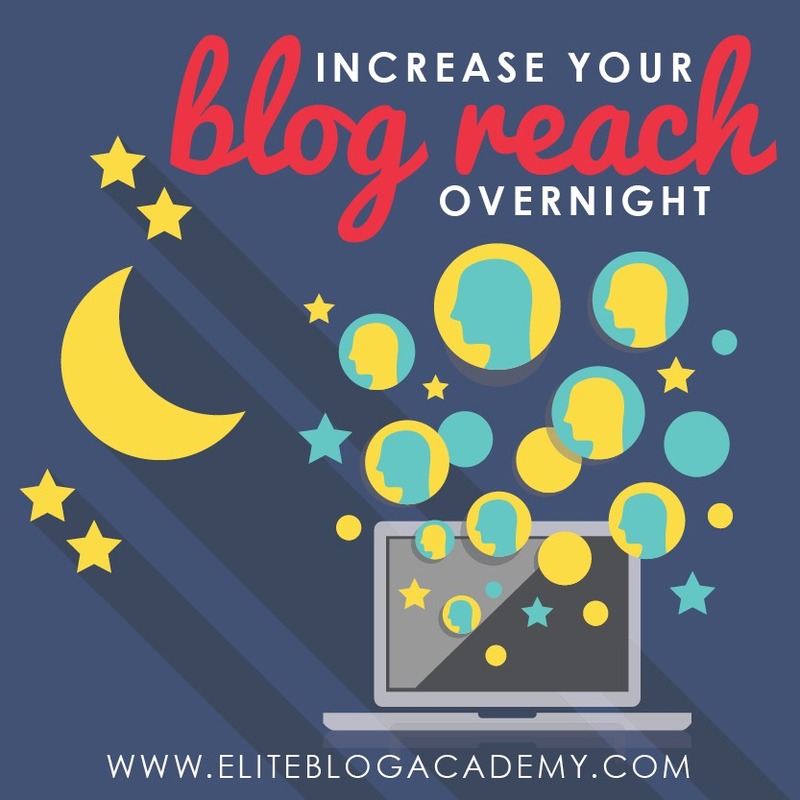 And, following these five easy-to-do steps, you can virtually increase your blog’s reach overnight! Pinterest is probably one of the best places to start expanding your blog’s reach and start growing an audience. To start in Pinterest, you want to create attractive, eye-catching graphics and optimize both your pins and your boards for keywords that can be easily searched. If you don’t yet have a lot of your own content, Pinterest can also be a great way to become a curator of content that is related to your own core topics. You can do this by setting up boards for each of your core topics, then pinning related content on a regular basis. This way, your reach grows through people following your boards because they love what you are curating. And, when you start creating your own content, you can share it to the fan base you’ve already established there and it’s likely those followers will re-pin your pins, and you are well on your way to skyrocketing your blog’s reach. Commenting on other blogs gives us the opportunity to connect with other bloggers in our space, most of which have larger audiences and more experience than we do. When we connect with other bloggers, we can create allies and friends that support our businesses as they grow. But, one of the hardest parts about commenting is walking that fine line between being too sales-y and spreading the word about your content. But if you practice commenting well (giving feedback to others, and steering clear of too much self-promotion) than commenting can be one of the quickest ways to improve your reach and drive traffic. SEO is definitely one thing we always pay attention to. It’s an ongoing task, and we make sure that every post is fully optimized. But, we promise, it’s not as hard as you think, and you don’t need to be a pro to get your posts ranked in the SERPs (Search Engine Results Pages). Google’s job is to help people find amazing content. SEO helps Google understand what each page of your site is about so they can help the right people find YOUR amazing content. When it’s done strategically, guest posting is a great way to get your content in front of a new audience, make valuable connections, and tap into a whole new traffic source. The keyword here is strategically. Writing a guest post takes time and energy, so if you’re going to do it, you want to be sure it’s time and energy well spent. It’s not about guest posting wherever you can. It’s about guest posting on blogs that will justify that time and energy, and deliver the reach you’re looking for. When you guest post on blogs with audiences similar to yours, that content will (hopefully) intrigue their readers enough to check out your blog and become your own faithful and dedicated readers. There’s no denying it: Facebook ads are absolutely EVERYWHERE. And if you’ve been paying attention, it probably seems like everyone who’s anyone is touting the wonder that is Facebook ads. We too think advertising on Facebook is amazing. Ads can be pretty awesome and an incredible tool for building your business and expanding your reach. If you’re first starting out and wanting to reach a larger audience, then you definitely need to try boosting a post. A boosted post is a Facebook post you “boost” to get it in front of a larger group of people. You create a post that has some sort of revenue driver (like a blog post that includes an affiliate link or an email capture) and share it directly to your Facebook page, just like you would a normal post. As long as you have an ad account on Facebook (and if you don’t, you can learn how to set one up here), you’ll see a button that says “boost post”. Click that button, and it allows you to set a budget and targeting parameters for your post. If you are craving more in-depth information on Facebook Ads, read our Facebook Advertising Basics post. Upping your Pinterest game, commenting properly, optimizing, guest posting, and boosting posts on Facebook are just 5 easy ways you can virtually increase your blog’s reach overnight! Awesome ideas! The “fear of SEO” is a real thing, for sure and I think it’s the next stumbling block I need to overcome. Thanks for this! Though I am still starting out and reaching very few people, I can attest to the effectiveness of making thoughtful comments on other’s posts. It introduces you into the blogosphere and can give people a reason to check out your own website. The key is thoughtfulness, though! Don’t waste your time if you’re just going to give a generic response. I totally agree with Step #1- that would have been my first recommendation too! I’m still really intimidated by Facebook ads. Even SEO seems easier for me to understand! But it’s one of the next things I’m determined to figure out. I’ll definitely be checking out your Facebook Ad Basics post. Thank you! All these tips are really important to boost blog reach. Pinterest is my top traffic source. If you market your blog strategically on Pinterest, it can be a great source for you too. When it comes to SEO, I just research keywords before writing a post. I look for the high search volume and low competitive keyword. It is better to look for a long tail keyword. Once I find the keyword, I just use the keyword throughout my content. More specifically, I use the keyword in post titles, post-introduction, post body as well as in post conclusion. Increasing blog reach takes time and effort. You need to consistently do this. The best strategy is to take one channel at a time to market your blog. Once you become familiar with the channel then move on to the next channel. Otherwise, you’ll be overwhelmed. You are right about these tips. When I started using Pinterest I went from less than one hundred views a month to 1.2K in the last 30 days! I’ve only been really dedicated to pinning for about two months. It really works! Step 2, comment on all your posts;) OK, will do! SEO, yeah I’m working on that. I think I’m doing OK, but I need to do more research on what keywords to target. Haven’t done any guest posting either, and definitely need to learn more about Facebook ads. Thank you for all the tips. I’m learning to be more productive with less busy work. This is one of the ways. This is a new and uncharted course for me. Excellent tips! Pinterest is by far the biggest funnel of traffic to my blog. It is a new blog so I’m continually working on SEO. It’s also a good idea to revisit your top posts and continue to work on the SEO and updating those posts as well. Gives practical advice on how to grow my reach. Something I will incorporate is really considering boosting a post. The summary of points at the end of post is something I want to incorporate. I LOVE SEO and wish I’d known about it years ago! It definitely makes me feel more confident in the quality of material I’m putting out there! I definitely need to up my guest posting and commenting game! I have been focusing on Pinterest and SEO for a long time and should improve other areas now.